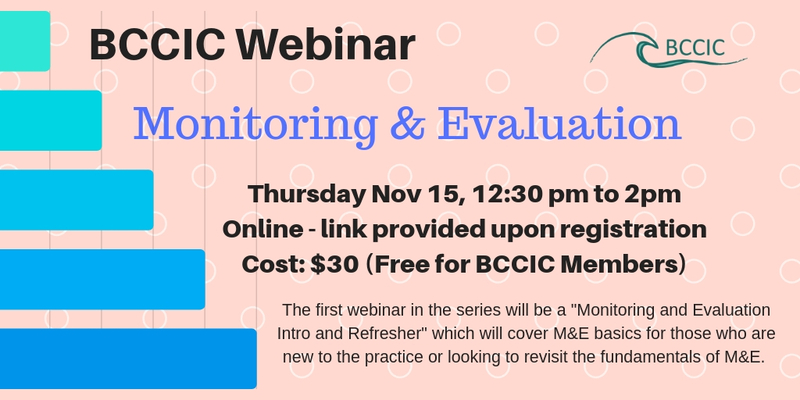 In response to member demand, BCCIC is happy to announce a new monitoring and evaluation (M&E) webinar series for international cooperation organizations. The series will start with an M&E Intro and Refresher webinar before taking a deeper dive into results based management, theory of change, and M&E case studies and clinics. Cost: Free to BCCIC members! Non-members pay $30. We will be recording the webinar and will make recordings available to all those who have registered. We look forward to seeing you online on November 15th.